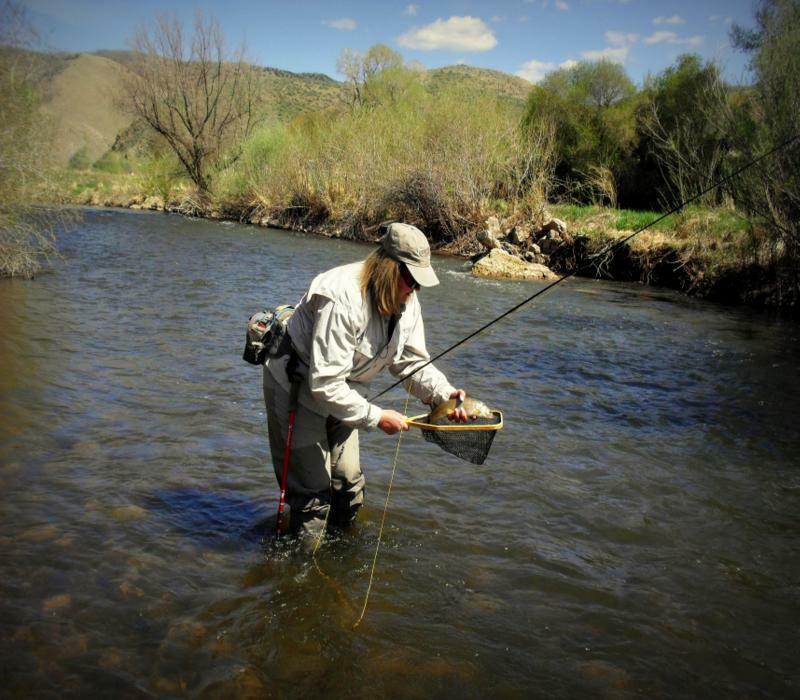 Is there really luck in fly fishing? This is my take on the subject. You might agree, disagree or think that it is a bunch of nonsense. Whatever you think, here it goes... On my journeys to the river lately, I am finding myself in situations of people asking me for advice. I guess that you could say that I am giving "tippets" on other days of the week besides Sunday! Now, who am I to give advice about the hatches, flies to use, the water temperature, the barometric pressure... etc. I am no guide. I am just the River Damsel. Over the last four years or so, I have attended more classes than you can count fingers. Or toes. I'm sure that has added to whatever skills I have. It's been a continuous learning adventure. Then, the friends that I have fished with who have given me added bonus tips about this and that has been priceless. But, now it surprises me when fly fishers stop me at the river and want to know what I'm doing different. Am I in a lucky streak? I most humbly say "no". I used to think that it was all luck. (Because of my catch rate) Now, I can tell you that it is more than luck. It's learning. It's finding the place where the fish are feeding. Finding the right place at the right time is not always an easy job. It's the mend. Have I found that out this past year! My friends have tried to help me learn to mend and to use it to catch fish. The #1 way to catch a fish is a good drift. Without it, you are working harder and longer. I truly believe that. And maybe for nothing. It's fly selection. Yes, there is a reason why we fly fishers look at the bushes, trees, and rocks while at the river or stream! It's not just because we are snoopy and wonder what is out there. 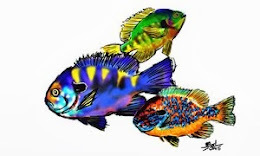 We want that little bit of advantage in finding the food that the fish want to eat. It's that simple. Or is it? Ha. It's the cast. Ok. I am not one to brag about my casting abilities... I have none. But, I do somehow get that fly where it needs to be, most of the time. It might not be pretty. Correction, no it isn't pretty. Casting only helps you throw the line through the air. But the fish don't live in the air. They live in the water! So, if you can get that fly in the right lane of fish traffic, you are doing well. And all you need then, is the good drift. Oh, and the right fly. Ok...it might not be the "right" fly. But, something close. 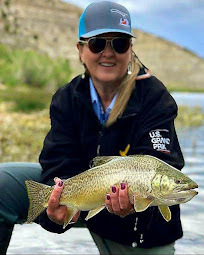 So, when people stop me and want to ask a question... (like I often do to others), I am more than happy to share the little knowledge that I have acquired throughout my journey of fly fishing. It seems funny to me that others think that I know what I am doing... haha. But, when you have a fish in the net, you can't say that you don't know. Right? Because it isn't luck. It's downright experience! And perhaps a little bit of study, practice and patience... yes, that especially. = ) Recently, I have had more fun observing others and seeing them catch a fish after I have given a bit of help. 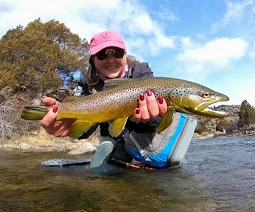 Yes, fly fishing... whether it is a solo trip or a shared experience on the water with others, it is always different each time out. So, if you want to call it luck... go right ahead. But, I don't believe it is a luck game. Because if two fisherman have the same flies and different results... those previous factors that I have mentioned above, must have come into play. I have been on that end of not being as productive as my neighbor on the water too. That is why I am still practicing that mend!!!! The journey continues... And what fun it is. Couldn't agree with you more, RD, on the subject and points of this post. The more you fish the more you know. 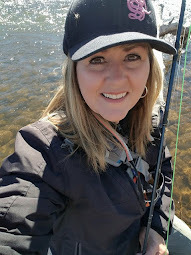 You become a "Fishing Veteran" with a volume of trial and error that you can share with others when they need some help. Mel - I'm just glad that the education is finally paying off. 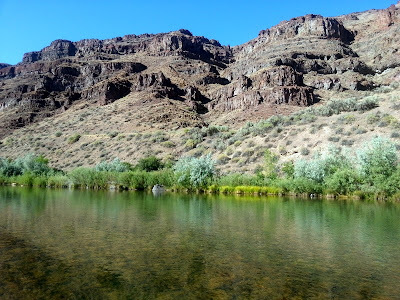 Many trial and error river outings, but it is part of the learning curve. Owlie! Where having you been hiding? : ) oh...behind that most recent canvas...I'm sure. I completely agree with you! It comes down to experience and time on the water. Since returning to school I haven't had much time on the water, and I notice that my catch rate has dropped. Argosgirl - Yes, I remember those days...long, long ago. Good luck in your studies! They are the most important thing right now... Fishing will always be there. I agree with all you've said, but I think you missed one detail. Fishers (the new proper way of saying fisherman/woman) like you, me, and a host of the others we know, have the right attitude. Now when I say attitude, all I'm referring to is that when we go on the water we don't think "I'd like to catch a fish today". Our thinking is that "The fish are out there and just waiting for our presentation". Positive attitude catches fish every time. Mark - P.M.A. will always bring more fish. Absolutely! If you go out with your head down and not believing that you can do it...the percentages go down. Thanks for bringing that up. I think you might want to add time on the water. By the frequency of your posts I'd say you have more than most. Ahhh... You are sweet, Bill. Thank you. I'm glad you have found something over here to help. I have learned a lot in my short 4-5 yrs.. Now, it is polishing time! Thanks for reading. I could not agree more and love that Mark added the positive attitude segment. So crucial. Negative attitude will kill a day on the water when "things just aren't going right" you need to positive attitude to be able to sit back and reassess. Atlas - I have watched people beat themselves up.over a dismal day. It doesn't do any good to become frustrated and angry... Your presentation will show your feelings and the cast and drift will be affected. I've seen it happen. That's when I give the pep talk... lol. I'm paying more attention after all, you can't argue with success. Howard... I'm just glad to hear you are on the water...even if it is for carp!